New Shark Fin Ban: (from left to right) Filmmaker Rob Stewart, Laurie Peterka, Shawn Heinrichs, Cinta Kaipat, Meaghan Hassel-Shearer, and Northern Mariana Islands governor Benigno R. Fitial during the shark fin signing. The Commonwealth of the Northern Mariana Islands (CNMI) marked another milestone yesterday by becoming the first U.S. territory to ban shark fins. It was inspired by Hawaii, the first U.S. state to make it illegal to possess, sell or distribute shark fins. The CNMI, in turn, inspired Guam to also introduce a similar bill. Gov. Benigno R. Fitial, who signed the bill into law yesterday morning, said this should also inspire other island nations and countries to pass their own shark protection laws. 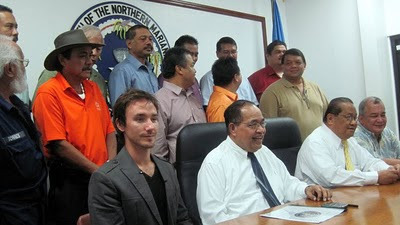 A Proud Moment: Local officials and filmmaker Rob Stewart join (front row: left to right) Governor Benigno R. Fitial, Lt. Governor Eloy Inos, and Delegate Gregorio Camacho Sablan for a ceremonial signing on Saipan. The new law prohibits possession, selling, offering for sale, trading, or distributing shark fins in the CNMI. It, however, allows catching of sharks for subsistence or non-commercial purposes. “With passage of this bill, yet another region of the Pacific takes a strong stand against the trade of shark fins and the sale of shark fin soup. It sets a great example for the region to ensure a sustainable future for the islands,” said WildAid executive director Peter Knights. Fitial said he received only positive comments about what he described as a “landmark” legislation, and that he was never pressured by anybody not to sign the bill. 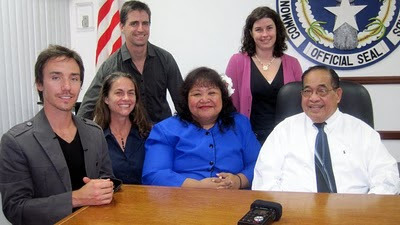 “Today, we proudly follow suit behind Palau's creation of a shark sanctuary in 2009, Hawaii's law banning all shark products in 2010, and President Obama's enactment of the Shark Conservation Act just this past January 4th,” Fitial told the crowd inside the conference room who witnessed the signing. Restaurants in the CNMI that possess shark fins may still serve shark fin soup, sell or offer for sale shark fins within 90 days from yesterday. After that, it will be illegal to do so. House minority leader Diego T. Benavente, the bill's author, said the work does not stop here. He said attention should be focused on enforcing the law. “I'm just so happy that it's signed into law not because it's my bill and that it's the first public law to be signed this year. It's because of the fact that I truly believe in the legislation, that it will make a difference in the lives of CNMI people but also to people in other parts of the world by helping to protect sharks and the marine environment,” said Benavente, a fisherman himself. Persons found in violation of the new law may be fined not less than $5,000 but not more than $30,000, and/or imprisoned for not more than six months. This early, Fitial said, he has already received inquiries from a Hong Kong-based entity planning to come to the CNMI for eco-tourism, as a result of the anti-shark fin law. 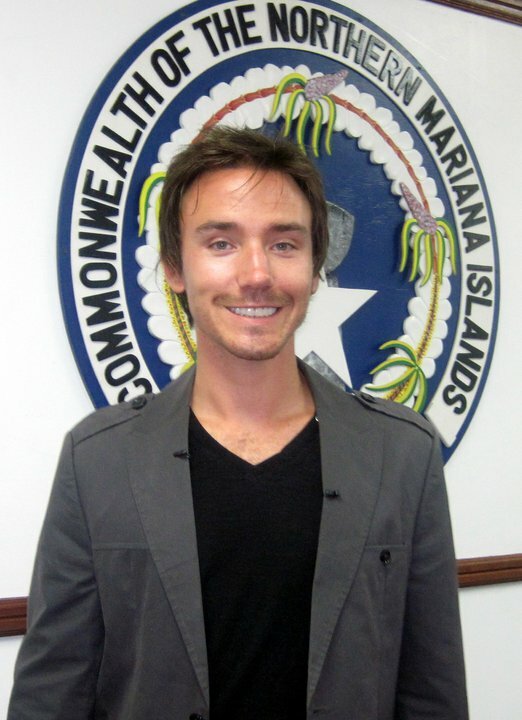 Rob Stewart, director of the acclaimed documentary Sharkwater, was also at the bill signing, which he said will be included in his next film. Stewart came to Saipan at the invitation of San Vicente Elementary School's sixth grade students of teacher Kathy Pagapular. “I could have said no, but the fact that a grade 6 class sees that there's a change needed in the world and tries to do something about it, it's huge, and if I could play any part in encouraging young people to take matters into their own hands and try to make the world a better place, I'll do that,” he said in an interview. After spending Wednesday diving with sharks and hanging out with eagle rays, Stewart said it's an amazing experience to witness the Thursday bill signing, which he hopes will be replicated in other island nations and countries. Also present at the bill signing were Lt. Gov. Eloy S. Inos, Delegate Gregorio Kilili Sablan, Speaker Eli Cabrera (R-Saipan), Senate President Paul Manglona (Ind-Rota), Tinian Mayor Ramon Dela Cruz, other CNMI lawmakers, other government officials and community members supporting a global movement to protect sharks. On the eve of his bill signing, Fitial said he got a call from Pacific Regional Fishery Management Council executive director Kitty Simonds at 9:30pm on Wednesday, but he said the call was only to remind him that there's already a federal law that prohibits shark finning. Wespac is tasked with managing fisheries in U.S. waters in this part of the world. Fitial, in an interview with reporters after the bill signing, said he told Simonds he's aware of the federal statute which he thinks is stricter than the one he's about to sign. The governor said he's comfortable with the bill he signed. The governor said he also got a call from Hawaii State Sen. Clayton Hee early Thursday morning, asking whether he would sign the law after reports came out that there were some concerns about it. “I told him the specific time that I'd sign the law-at 9:30am,” Fitial said, adding that Hee would have wanted to come to Saipan for the signing. Hee's bill became the strongest shark protection law in the nation. He was on Saipan in December to drum up support for Benavente's bill, which is modeled after Hee' bill that became law in Hawaii last year. Fitial said the CNMI has seen much progress in preventing overfishing, minimizing bycatch, and protecting fish stocks and habitats. “However, there is still room to do more,” he added. To protect its natural wealth, the CNMI has created marine protected areas, has been doing coral reef monitoring, and holding educational outreach programs to teach people about the importance of conservation, among other things. “Now with the implementation of the Shark Fin Prohibition Act, we can add protecting the animals at the top of the marine food chain-sharks-to that list,” said Fitial. Fitial, who was also interviewed by Stewart for his Sharkwater sequel, shared that sharks also have medicinal uses. He said when he was still infant, his folks used shark liver to help cure him of an illness. Up to 73 million sharks are used in shark fin soup every year and the trade has been the major factor in the decimation of global shark populations. Humane Society International said they have already seen the positive ripple effect as Guam's legislature has picked up the torch from the CNMI and is contemplating a similar bill. “The legislation shines a positive international spotlight on the CNMI and positions the islands as a pioneer in shark and ocean conservation,” said Iris Ho, wildlife campaign manager for Humane Society International which, together with its partner organizations, is one of the world's largest animal protection organizations. It said the CNMI joins island nations and regions in taking strong actions to protect sharks, including Palau, the Maldives, and Raja Ampat, Indonesia. “One by one, Pacific Island communities like the CNMI are taking steps to protect valuable shark species to ensure the health of their precious marine environments,” said Michael Skoletsky, executive director of Shark Savers. Benavente's bill, House Bill 17-94, House Draft 1, Senate Draft 1 is now CNMI Public Law 17-27.